Time to get back into routine after another awesome weekend. I've been having the best time recently and Im super happy and excited about things all over again. I adore this dress, its my go-to black dress for loads of occasions including layering. I love the shiny fabric and the fit, super flattering. I paired it up with my favourite red blazer and my simple flats for a easy summer evening outfit. I have no idea where this necklace is from as it's my flatmates, Im going to guess either H&M or Primark. It's really lovely though and a nice simple colour pop. I've decided my jewellery collection needs a refresh so Im going to sort all my tangled mess of necklaces out and see what I can come up with. Will keep you posted on that! Tonight I'm off to the gym to do my standard hour on the treadmill. I'm dreading it but Im determined to finally get around to doing my 10k race that I've been planning to do for years. I've wanted to do it for so long but I always seem to start training and never push myself that extra few km. I can do about 7.5k easy but those last two really push it for me. I've bought new trainers (new gym clothes are always a good motivation I think!) and I'm in the zone. Lets do this. Then after a good sweat out in the gym, I'm going to chill out. Monday night's are typically my TV catchup day so I've got all my shows scheduled for tonight, going to light some of my new scented candles (I've become THAT kind of blogger) and veg out in my bed. I presume I wont be able to walk after pounding the treadmill for so long so it's perfect! Absolutely love this dress and blazer combo, another perfect outfit. Really great classic color combo ! It must be great having a flatmate that shares the same style in a way with you. Borrowing her things and such. It is a gorgeous look! Beautiful red and black combo. Love the cute dress. these are all such perfect staple pieces! good luck with your 10k, you can do it girrrrl! This outfit looks great! I'm on a health kick as well right now so good luck for tonight. An Epsom salt bath is always great for sore muscles. I love the dress! lovely as always! 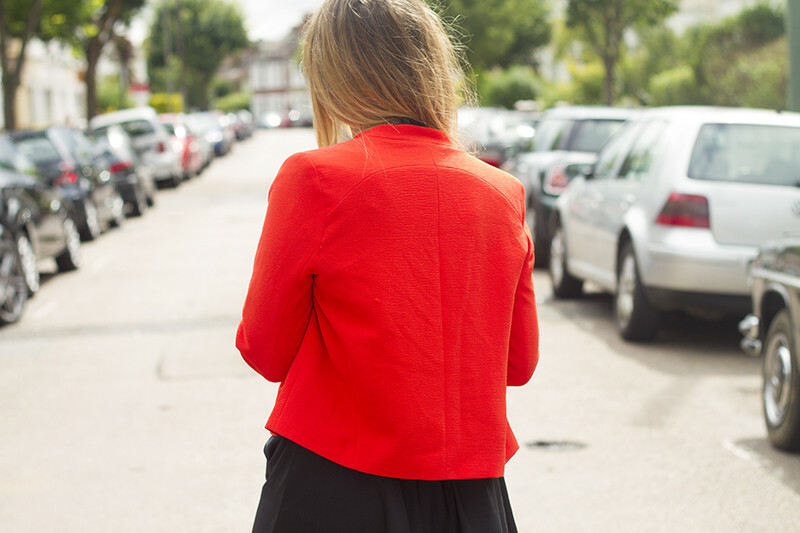 This outfit looks so lovely, love the pop of colour that the blazer adds! Ooh what shoes did you go for? Good luck on your first 10K! What one are you going for? once again looking gorge in colour! love this blazer its beaut! Love the blazer loads! & good luck with the 10k! Love the outfit especially the bright jacket which contrasts with the yellow gems in the necklace, so pretty! Haha love how you say you mong out on the bed and light candles, i'm the same kinda blogger as you. Can't beat a good ol' relax and catch up with the programmes! I really love how you spruce up outfits with bright items! I love these AA dresses, they're amazing. Red is such a good color for you. Thant's so great that you're training for a 10k. Good luck! love the black n red! Good luck with the treadmill! I have that jacket in bright pink and have no idea what to wear with it other than a lace blouse and skinny jeans. I'll have to try it with a plain coloured dress! The red looks lovely, it really suits you. love the black and red combo! and those sandals are so badass! Love the blazer and the neon/crystal necklace, so pretty! I need to start getting back into the gym! that outfit is perfect <3<3 love love love! Gorgeous! Love the red of the blazer with the yellow of the necklace. Love how you've styled the colours! Ahh get that jacket in my life!! 'I've become that kind of blogger' - I love this, but scented candles are so pretty and relaxing! & I absolutely love your dress, you look beautiful! Love the shots.. your blazer looks amazing! I love these American Apparel dresses, I got a floral one the other day and am desperate for the leopard print one too! You are looking lovely in this outfit. I like your flats also. I also own a pair of flats like this one and I bought them from Metro Shoes. I love to wear them because they are very comfortable.